Travel from Kolkata, through Assam, to explore the little visited state of Nagaland in India’s far northeast, on this 17 day small group holiday. This remote region sees very few visitors and its people have more in common with their neighbours in Burma and Tibet than other parts of India, making this region fascinating and distinct. Dogged by unrest and an unstable political and security situation, Nagaland was off limits for many years, but things have improved greatly here in the last decade, making it possible to explore this little known and very beautiful corner of India. Our first stop on this exciting journey is Meghalaya, where bridges made from living tree roots span streams and rivers in this wild landscape. 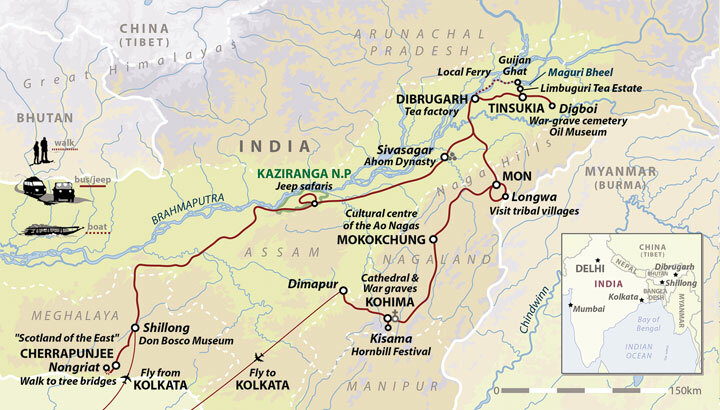 We then move on to Kaziranga National Park to spot wildlife and explore the tea plantations of Assam. We will take the ferry over the mighty Brahmaputra to Majuli Island, the world's largest river island. We will meet the loca tribes that make these frontier lands home, and finally, will crown this very special trip with two days at the colourful Nagaland Hornbill Festival. We will travel by minibuses, local river boats and domestic flights, with a tour leader and local guides and drivers. This is the perfect trip for adventurous travellers, who have perhaps visited India before and are looking to push a little deeper into its remote corners. On this trip to Nagaland in India we have developed unique relationships with many people, some of whom help us with our tours, others that simply live in the different regions to which we travel through. Through our form of interactive, socially conscious tourism we have helped them adapt to the modern, changing world by providing an important additional income. In addition we sponsor the following projects: In arid Rajasthan and Madhya Pradesh, we have implemented tree planting schemes (a hands on experience for some of our trips!) as well as helping directly with the financing of rural village schools. When you take one of our trips, we make a contribution to “Carbon Clear” – an organisation devoted to ‘offsetting’ or ‘neutralising’ harmful greenhouse gas emissions caused by your flight. This is done by funding projects across the world that will reduce greenhouse gases on your behalf through sustainable energy or rainforest restoration. In Calcutta we support the Hope Foundation, an organisation devoted to helping and improving the living conditions of street children by offering education, health services and nutrition and to help give them a better chance in life. All our tours employ the services of local guides and drivers, and on this trip we will be staying in traditional bamboo houses, locally run hotels and guesthouses – we also often staying in our guides villages and homes, which again diverts important funds directly into the area. The wonderful thing about this kind of interactive tourism is that everyone gains – the locals financially, and our clients with the unique experience and social interaction. We will visit local industries (learn to milk a buffalo, make a sari, cook a meal) and call on local organisations to learn more about the problems of the region and how we might help. Not only does this allow local people and visitors to interact and learn about each others culture, it ensures that the revenue generated by tourism goes directly to local communities. We also support several NGOs around the world such as the TESFA community project in Ethiopia, A-Cet and Adopt-A-Minefield, which are all carefully selected to improve the standard of living for the communities we visit.